WASHINGTON, Aug. 14 (Xinhua) -- The past week has seen Washington slap a raft of punitive actions on Iran, Russia and Turkey. In response, the three countries have enhanced their coordination, which, in the eyes of U.S. experts, aims to soften the blow of the sanctions and push Washington towards talks to settle disagreements. The United States announced on Aug. 6 that it would re-impose sanctions on Iran that had been suspended under a landmark 2015 nuclear deal. The first batch of sanctions took effect on Aug. 7, and targeted Tehran's purchase of U.S. banknotes, trade in gold and other precious metals, the use of graphite, aluminum, steel, coal, and software used in industrial processes. Another round of sanctions, to be reinstalled on Nov. 5, will be slapped on Iran's port, energy, shipping and shipbuilding sectors, its petroleum-related transactions, and business deals by foreign financial institutions with the Central Bank of Iran. On Aug. 8, the U.S. State Department announced the United States would impose new sanctions on Russia over its alleged poisoning of an ex-spy and his daughter in Britain. According to senior State Department officials, the first phase of sanctions will ban the granting of licenses to sell "all national-security sensitive goods or technologies" to Russia. Unless Russia, within three months since the sanctions become effective, provides "reliable assurances" that it will no longer engage in chemical weapons use and allows on-site inspections by the United Nations or other internationally recognized impartial observers, the second batch of "more draconian" sanctions will be imposed. These would deal a blow to some 70 percent of the Russian economy and result in an approximately 40-percent fall in the workforce. Later on Aug. 10, U.S. President Donald Trump tweeted that he has authorized to double the tariffs on steel and aluminum products from Turkey to 50 percent and 20 percent respectively. Earlier this month, Washington has slapped sanction on two Turkish ministers. Trump's announcement further led to a nosedive in the nation's currency lira to an all-time low against the U.S. dollar. Analysts believed that the U.S. actions, as sudden as they appeared, were actually quite targeted: Iran's energy has been part of its livelihood, and the ban on its rights to purchase dollars would deprive the country of its ability to trade on a dollar-dominant world trade system. The actions against Russia would affect almost all of its state-funded enterprises, taking a toll on the Russian economy. The tariffs on Turkey have added to the pressure on the country's currency as well as the financial markets of the region. David Pollock, a senior fellow at the Washington Institute for Near East Policy, told Xinhua that the United States' actions' main goal was to create "a lot of popular anger" inside the countries. "I think that that's really the main goal of applying this leverage in order to get the people to put pressure on their own governments, to change the policies," he said. The responses of the three nations to the U.S. pressure campaign show a tilt towards realignment. After Trump's tariff tweets, Turkish President Recep Tayyip Erdogan called his Russian counterpart Vladimir Putin over bilateral and regional issues, vowing to continue cooperating on defense and energy. Russian Foreign Minister Sergei Lavrov will visit Ankara on Monday to meet with his Turkish counterpart Mevlut Cavusoglu, in a bid to discuss their economic and trade ties, in particular the building of the Akkuyu Nuclear Power Plant and the Turkish Stream Gas pipeline. Any substantive agreement on energy cooperation would be a much-wanted boost to the fuel-thirsty Middle East nation. There were also signs of increasing coordination between Iran and Russia. 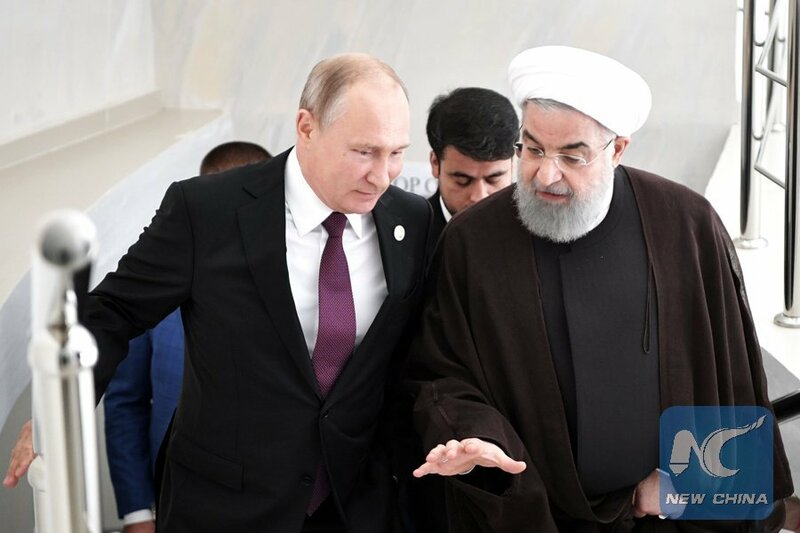 Soon after the United States announced it would reimpose sanctions on Iran, Russia vowed to safeguard its economic and trade ties with Iran on the national level, and explore plans to work with other parties to promote economic cooperation with Tehran. On Sunday, the two nations, together with Kazakhstan, Turkmenistan and Azerbaijan, signed an agreement for the collective use of the Caspian sea, the world's largest inland body of water. The five nations promised to strengthen regional trade and economic ties and to ban non-littoral states from deploying military force on the sea, which essentially prevents external countries from intervening in regional issues with military power. Ties between Ankara and Tehran have also been warming up. Erdogan said Turkey has many alternative parties to work with economically. In support of Turkey, Iranian Foreign Minister Mohammad Javad Zarif tweeted that "Trump's jubilation in inflicting economic hardship on its NATO (North Atlantic Treaty Organization) ally Turkey is shameful." Darrell West, a senior fellow at the Brookings Institution, told Xinhua that as the three countries are "the subject of sanctions from the United States, they are uniting to blunt the economic impact of the sanctions and help each other weather the crisis." "That union could sway the power balance within the Middle East by recalibrating existing policies. 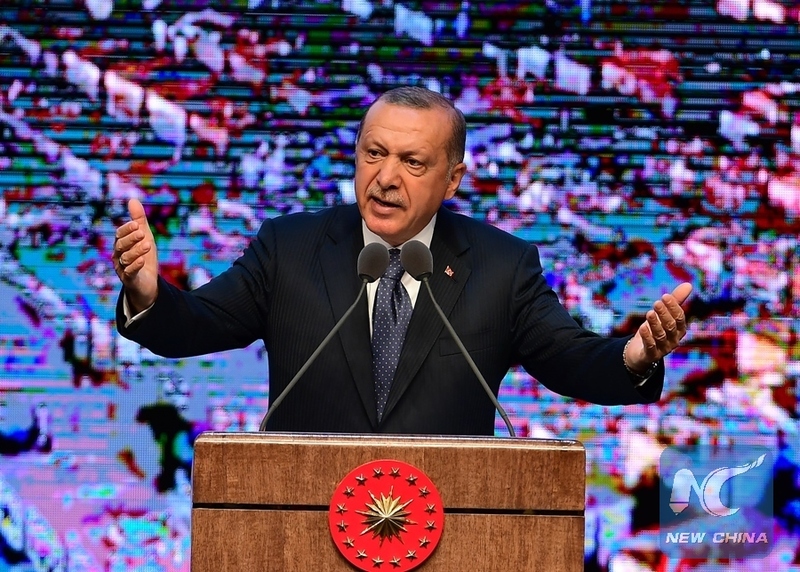 For example, Turkey hosts a U.S. military base that supplies troops in Iraq and Erdogan could threaten to slow deliveries in response to the sanctions," he said. Benjamin Friedman, a foreign policy fellow and defense scholar at Defense Priorities, a Washington-based think tank, also told Xinhua that "the three nations are cooperating in limited ways, largely around the war in Syria." "That pits them against the United States diplomatically in Syria," he said. "I will say, however, that Iran's decent relations with various powers, including the three you mentioned, plus China, Iraq and even European states, makes it harder for the Trump administration to isolate it." IMPROMPTU REALIGNMENT FOR DIALOGUE WITH U.S.
Analysts believed that the Moscow-Ankara-Tehran trio was more impromptu than calculated, not to mention its slim chance of replacing diplomatic ties with Washington. Moreover, the three countries' divergence on regional issues like Syria also limited the prospect for further engagement. The trio was believed to also seek to pressure Washington to minimize its preconditions for talks and maximize its willingness to solve the bilateral disagreement with each nation. Defense Priorities' Friedman said to say the three nations are confronting Washington "goes too far," since "their alignment remains limited." 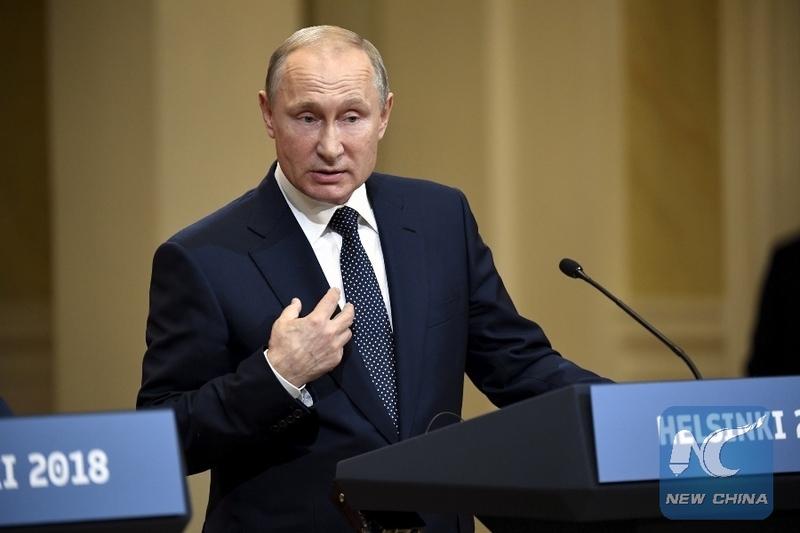 "Turkey and Russia's recent cooperation is important for NATO, Syria and other things, but has not reshuffled the balance of power broadly," he said. "Keep in mind that Turkey, for all its trouble with the U.S., is still a NATO ally, and NATO exists to potentially confront Russia." Moreover, it is the U.S. policies in the Middle East that drive the limited cooperation of these countries, Friedman said. "Their alignment will likely break down if we quit meddling in the region's conflicts, especially Syria." Under such considerations, the three nations, besides trading barbs with Washington, did not miss an opportunity to offer to hold talks with the United States. Dan Mahaffee, senior vice president and director of policy at the Center for the Study of the Presidency and Congress, told Xinhua that although Turkey has long been pursuing a range of policies that diverge from the United States and its NATO allies -- both in a range of internal political matters as well as foreign policy -- its past economic growth has been driven by a greater connection to Europe and the region rather than further afield, though Erdogan is seeking to realign the nation.